Working at a grocery store isn’t the most thrilling experience one could have in life. Checking out customer after customer and scanning grocery after grocery probably gets tedious pretty fast. If only someone could inject a little life into such a monotonous job right? 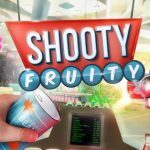 Well developer nDreams is doing just that with Shooty Fruity, their new supermarket job simulator that also doubles as a shooting gallery of sorts. To start if you want to play Shooty Fruity you’re going to need dual PlayStation Move controllers. There is no Dualshock 4 support for this game. 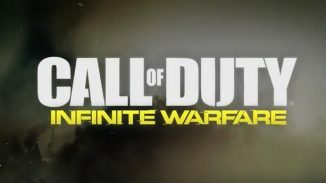 You start the game in the Staff room where you have a shooting gallery, a locker to change your current loadout, and a weapon vending machine to of course obtain new weapons. 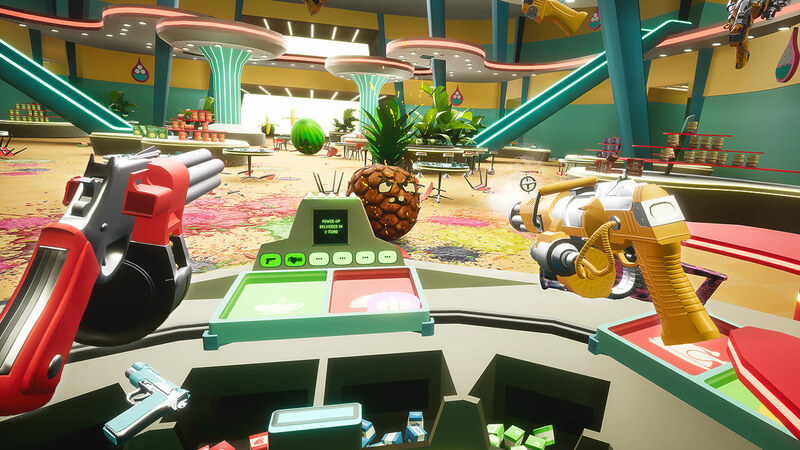 The gameplay consists of you scanning groceries but also having to fend off enemy fruit. There are different enemy types and some weapons are better against certain ones than others. I recommend spending some time in the Shooting Gallery before playing to get the feel of some of the different weapons so you know what to go to when the time comes. It all starts off pretty easy as you initially use your pistol to dispatch that evil fruit but things get more challenging as you progress. As you kill fruit you’ll collect Juice which is the currency you’ll need to purchase new weapons from the Vending Machine. But that isn’t the only criteria to obtain weapons as you’ll also have to complete challenges in each stage as well. These range from earning a certain amount of juice to using a particular weapon to kill a certain amount of enemies. There are power ups in the game as well that will boost your fire power or give you certain advantages. The overall gameplay felt great and responsive as I scanned groceries with one hand while bringing down the legions of deadly fruit with my weapon of choice with the other. You can even dual wield weapons as well but just be aware that those groceries pile up in a hurry so switching back and forth is key. There were times where I felt like the hit detection was a little off but that was few and far between. I can’t say enough just how much fun and how great this game feels to play. Worried about having to stop and reload? Nope just toss that gun away and pick up another and keep blasting. Want to toss a grenade but don’t want to stop shooting? No problem just move the grenade to your mouth to remove the pin and then toss it all the while still shooting or scanning with your other hand. It’s nice little touches like this that keep you in the moment to moment gameplay. If you’re worried about the game getting stale don’t worry as it does change up on you. At times you will work in the Canteen where you’ll be doing things like having to pack groceries a certain way or sort food onto the correct trays all while still fighting those annoying fruit. You can also replay shifts to complete objectives you missed out on the first time or to try for a better score on the online leaderboards. If you’re a trophy person there is even a Platinum trophy to chase after. 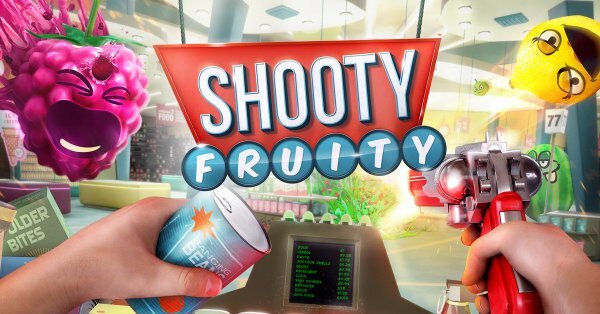 As you can tell from the screenshots Shooty Fruity has a great presentation. I played it running on a PS4 Pro and I personally think it’s one of the better looking PlayStation VR games out there. There is just so much color and detail in this game whether you are talking about the groceries or the way the fruit explodes when you defeat them. All the guns are designed well and look different enough so you don’t confuse them. Destructible environments are another plus and I had a lot of fun just blowing up shelves and other things. The sound design is pretty good as well as I never really got tired of hearing that satisfying beep while scanning groceries. The guns sound great and the soothing music of the store just seems to fit. You’ll even get tips from the loudspeaker in the store as well. 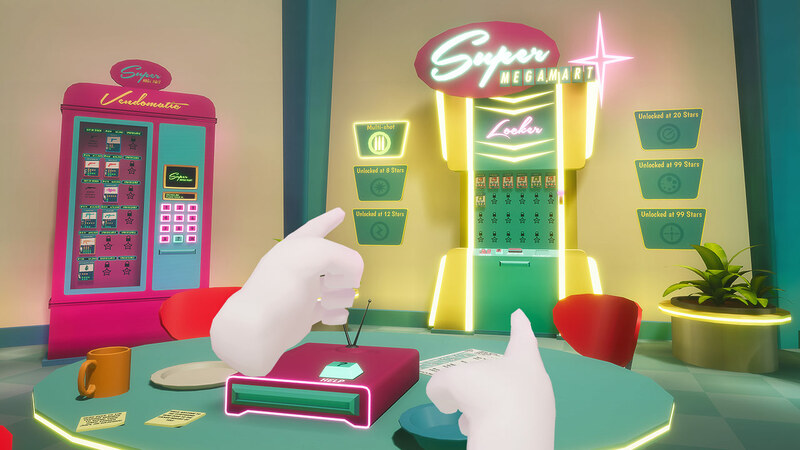 I’ll be the first to tell you that shooting gallery games can get old quick but nDreams seems to do just enough in Shooty Fruity to keep things fresh. The controls are simple and easy for pretty much any one to pick up and play. The wide range of enemy types, weapons, objectives and jobs give you plenty of reason to keep playing. 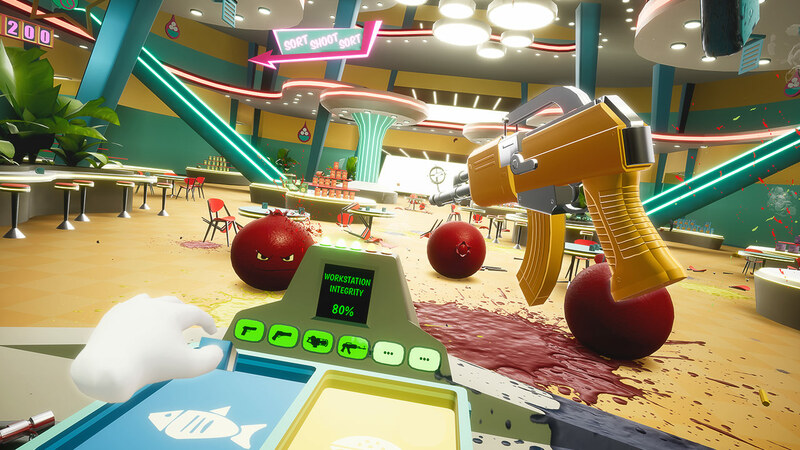 It’s one of the most fun experiences I’ve personally had in PlayStation VR and I highly recommend it. 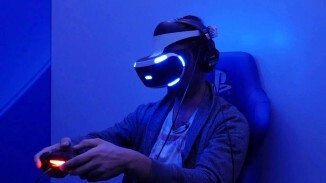 *Reviewed on a PlayStation VR hooked up to a PlayStation 4 Pro. Review key provided by nDreams. 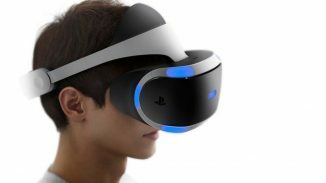 VR Headsets, the Next Big Thing in Gaming or the Next Big Fad?